The seven-year-old ran at Cheltenham in April last year with a rating of 69 and he is set to be raised again from his current mark of 142 after this success, his seventh this season. Keiran Burke was saddling a Festival winner in his first season as a trainer, having scored as a jockey last year on Holmwood Legend in the Byrne Group Plate. It was also a first Festival winner for jockey Nick Scholfield and an emotional owner, Dorset farmer Anthony Knott. “I can’t believe it - it’s another dream come true for me,” said Burke. “It happened to me last year and I don’t know why it has happened to me again. Knotty’s been winding everybody up all day and he is an absolutely brilliant owner. “The horse definitely won’t run here on Thursday, I’m putting my foot down, and I don’t know where we’ll go. There’s been talking of the Topham Trophy at Aintree but I’m not sure I want to risk him there, he’s my pride and joy along with my baby boy. “There’s still a bit more improvement to come from him, he definitely wants further as they went too quick for him today. You wait until you see him next year, he will have filled out and improved more. Maybe he might be a National horse. “Peter Brookshaw had him before me and I rode him here last year, he was pretty fat and just not very fit. I’m just lucky to have him in the first place. Knott added: “I told you we had two stone in hand and he did what I thought he could do. Some Liverpudlian pundit said that he was going to lay it - he hasn’t got a clue what he was talking about, saying it couldn’t jump left - if he wants to know what a proper horse is, he will see one there. “I told you all along that he was still in the wrong race - we could have taken the Gold Cup! I can’t get this into my head - what I said would happen has come true. I just hope everybody here backed it and skinned the bookies big-time! “I can’t express myself, I felt sick. I didn’t think that I would be able to go home because even the paper boys had backed it. I thought that I would ever be able to go back to Dorset if it lost. Jockey Nick Scholfield took another step towards establishing his position among Britain’s senior riders when riding his first Festival winner. The Devon-born rider, 22, a former novice champion of the point-to-point circuit (in which his dad, Philip, was a senior title-holder), won the Pulteney Land Investments Novices’ Handicap Chase on Hunt Ball, trained by Keiran Burke for owner Anthony Knott. When Hunt Ball won at Wincanton recently Knott jumped on his back as Scholfield rode him into the winner’s enclosure - and was fined by the stewards for his exuberance. Scholfield said: “Hunt Ball is a remarkable story and his owner Anthony Knott is so passionate about racing and his horses - he goes over the top some times, but he loves his horse. “Hunt Ball didn’t jump quite as well as he can today, but it was a more competitive race run at a faster pace. When I came to two out he came back on the bridle and picked up. It’s a great job by Keiran Burke to get him here so fresh and well. 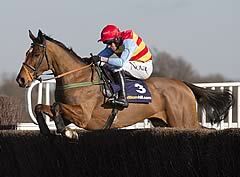 “He’s got a few pounds to find to be competitive in a race like the Gold Cup, but at least the dream is still alive. Scholfield’s happy day was soon tainted, however, when the stewards deemed he had used his whip four times when clearly winning, breaking a well-established rule that has not been affected by recent changes relating to the whip. The jockey was given a six-day ban from March 27 to April 1 inclusive. Educated Evans fell at the second last in the Pulteney Land Investments Novices’ Handicap Chase and broke his near hind leg. He was humanely put down.